At the age of 5, Marcus was convinced God wanted him to be a ‘pilot for Jesus’. With God’s confirmation, in their teenage years, Marcus and Julie began working towards joining MAF and in 1984 began serving with MAF in Arnhem Land. Between 1986 and 1996 they served in Papua New Guinea before returning to Ballarat where Marcus trained to be an Instructor. They were part of the Flight Training Centre at MAF AIR in Ballarat until its closure. In 2003 they moved to Coldstream where Marcus became the Chief Flying Instructor of the MAF Flight Training Centre, now a part of MAF International, with Julie as his Administrative Assistant. The MAF Flight Training Centre was moved from Coldstream in Victoria to Mareeba in Far North Queensland at the end of 2014. Marcus and Julie have helped to set up the new MAF Training Centre at the Mareeba Airport and are happy to be part of the MAF Mareeba team. They have 4 married children: Kelli, Lori, Erin and Travis and 13 grandchildren (as at February 2018). 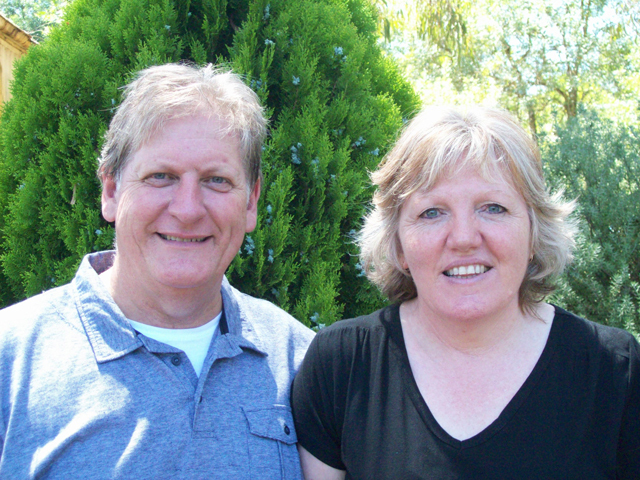 Marcus and Julie enjoy being part of a professional team who train and equip young men and women seeking to serve and honour God, using aircraft, throughout the world. Marcus was raised in a Christian home and was very aware of God’s calling on his life at a very young age. Julie became a Christian at the age of about 11 and remembers wanting to be a Missionary, hairdresser or air hostess! They grew up together through Youth Group and taking on various roles in their local Church. From the age of about 17 they were both committed to each other and seeking to serve God through MAF. Married at 20 and parents before the age of 21, they began the journey of raising their family and preparing for missionary service, which included training to be a pilot. “I know the plans I have for you” says the Lord, “they are plans for good and not for disaster, to give you a future and a hope”. Marcus and Julie feel very privileged to be working with trainee pilots and their families who are preparing for Mission. They endeavour to be good examples and encouragers of the next generation of Mission Aviators, sharing from their experiences and the truths of God. As the Chief Flying Instructor as well as the Chief Pilot of Mareeba and Timor Leste, Marcus brings a wealth of experience to the training, development and mentoring of the student and MAF programme pilots and Julie uses her Administrative skills to help in the office, and also encourages the wives in their preparation for the Mission field. In their spare time, they enjoy spending time with the family and grandchildren, which usually involves travelling. They dabble in renovating the house, love having visitors and have begun researching their family history. Marcus and Julie acknowledge and thank a great many people who have partnered with them over the years.